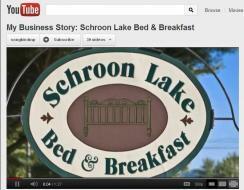 Schroon Lake, N.Y. - The Schroon Lake Bed and Breakfast is the winner of the best video award for the New York Region in the "My Business Story" contest on YouTube. "I initially learned about the program through the Professional Association of Innkeepers International forum, and submitted our entry just under the wire for the deadline on November 15th," said Sharon Piper, owner of the B&B. "We received notification of our win a few days later." The video features B&B owner Sharon Piper, who describes how she and her husband Mark fulfilled their dream to open their own Bed and Breakfast, and how they were attracted to, and welcomed by the small Adirondack community of Schroon Lake. "Websites are mandatory, and video is king," added Piper. "In fact, I&apos;ve learned that YouTube is second to Google as the largest search engine. We encourage other small businesses to post their own video with the My Business Story feature. Although the contest is over, the easy editing tools are still online as a resource for small businesses." According to the program&apos;s developers, Google research shows that online video can boost in-store sales by 6%, and boost brand recall by as much as 50%, and My Business Story can help small business owners make a great looking, professional-quality video to realize this potential. For more information about the Schroon Lake Bed and Breakfast, visit their website at www.schroonbb.com. YouTube&apos;s My Business Story program and a link to the contest winners can be found online at www.Youtube.com/mybusinessstory.